Curry leaves refers to the shiny, dark green, aromatic leaves of a tree (Curry Tree) which release a deliciously nutty aroma. It is a staple of South Indian cooking. Curry leaves are one of the highly popular herbs used in India and South East Asia. They are added to curries, stews, soups and many other foods. Many traditional and contemporary Indian recipes are not complete without curry leaves. 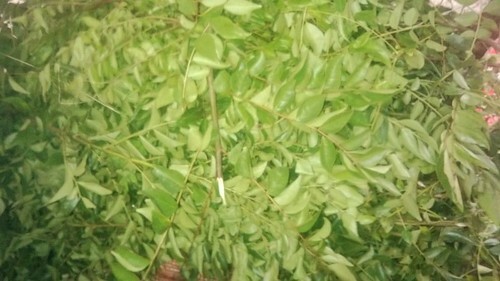 Curry leaves is known in Hindi as Kadi Patta or Kadipatha. This is one of the many things I have learned to love while on vacation in Kerala for a month. While some are not eating the cooked leaves, I picked them as soon as I see them. It has a lovely taste. I could have wanted to bring some, but it is not easy to travel with fresh things, so I just opted to take a picture of my favorite curry leaves.